Seen here is a boxed first shot 12" Boba Fett sample. 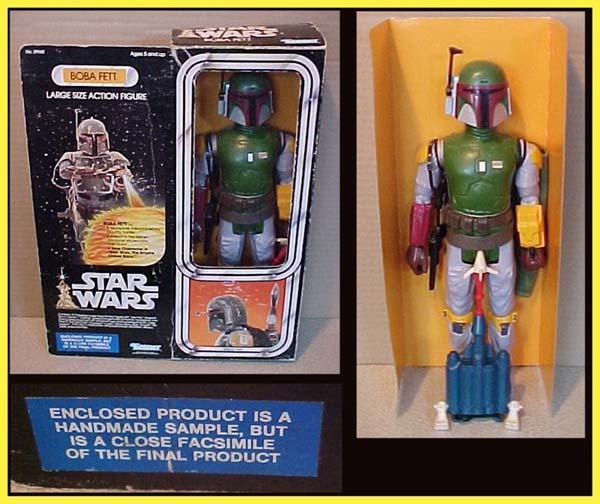 Although at first glance the figure might look the same as a standard Boba Fett, it features several noteworthy differences. For starters, it is missing the copyright information on the back of the leg. This is the telltale sign of a first shot. Secondly, the plastic is a different plastic than the production figure being less grainy. Finally, the backpack is unpainted. The box itself is also interesting in that it features a sticker describing the item as an early sample. Very few sample 12" figures have surfaced and this is the only boxed sample 12" figure of this kind that I am aware of. Interestingly enough, this very Boba Fett was first sold back in 1996 by Mark Huckabone. The actual ad featuring this sample figure can be seen on the Archive's Toy Shop Scrapbook. Many collectors enjoy seeing where items originate from and tracking their history.